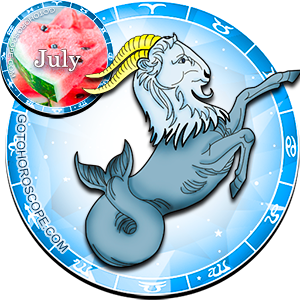 July 2012 Horoscope Capricorn, free Monthly Horoscope for July 2012 and Capricorn Astrology Forecast for the month ahead. Overview: If your mind is busy considering travel plans and vacations, this is definitely the time to go for it. Plan it well, though, making sure you return home after the 14th without any accident. Nevertheless, don't be surprised or even aggravated if you have to return home before the end of the vacations; the call to return will come for obligations in the employment/career area. Although it may feel like a nuisance, it will be a time during which you will be able to shine your true colors through, since, after the 21st, the Sun enters into your house of career. Throughout the month, keep an eye out for those purse strings. Uranus - the planet of positive and negative surprises - in your 2nd house of Money and Values, side by side with Neptune, the ever-elusive planet, could cause you to have a jolt or two where money is concerned. 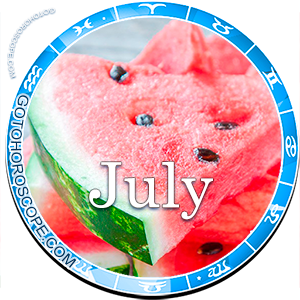 Since Jupiter, Venus and Mercury also make an appearance this month, these surprises will probably be more positive than negative. Career and Work: You have been working so hard, haven't you, Capricorn? Well, this is definitely the month to take a break, particularly because the beginning of the month may not be as positive as you wish regarding your professional department. However, make sure you make an appearance in the workplace after the 21st, since your charisma, determination and strength will help you find new opportunities and even a career change. Since Jupiter is happily prancing about, this could really be the beginning of something good; nevertheless, don't jump into anything before some careful planning. Finances and Money: Like mentioned earlier, Uranus, the planet of positive and negative surprises will be stationed in your 2nd house of Money and Values, siding with Neptune, the main causer of deception. Be that as it may, you should expect some surprises in the financial department. Whether these surprises are positive or negative, only time will tell, but the influence of Jupiter and Venus will probably mitigate any major impacts. Keep your spending under control and all will be well. Love and Relationships: After a period of working so hard to cope with your personal interactions, now is the time to enjoy those you love and, especially their company. Throughout this month, even with Mercury being retrograde, you will find that you are communicating better and more positively. Your close relationships may even be surprised with your easiness to communicate and to express your feelings, but be sure that this will be extremely positive for you. It will lay down the foundations for the tough times ahead. Health: Since you will spend the month out and about, you need to remember to take care of yourself. Make sure you are eating the right type of food - including plenty of fresh vegetables and fruit - and that you are resting enough. Keep an eye out for accidents around the 14th.